Git is a version control system (VCS), also known as a source code management (SCM) system. A VCS allows you to track changes to your code over time in such a way that previous versions are always available in case you have a need to go back. In larger projects VCS is very important in coordinating the work of multiple developers. Although a VCS may sound like overkill for a personal project or class assignment, Git has properties that make it quite ammenable to this use: (1) git runs locally, no need for network access to use it on your own projects, (2) git works on a per project basis, no elaborate configuration and simple per project initialization. Here is an example discussion on whether to use Git for personal projects. The overall concensus is that it is very appropriate! However, Git, is extremely powerful, it is used on some of the largest open source projects in history (in addition to powering GitHub), hence it has a large and potentially overwhelming slew of commands and options. 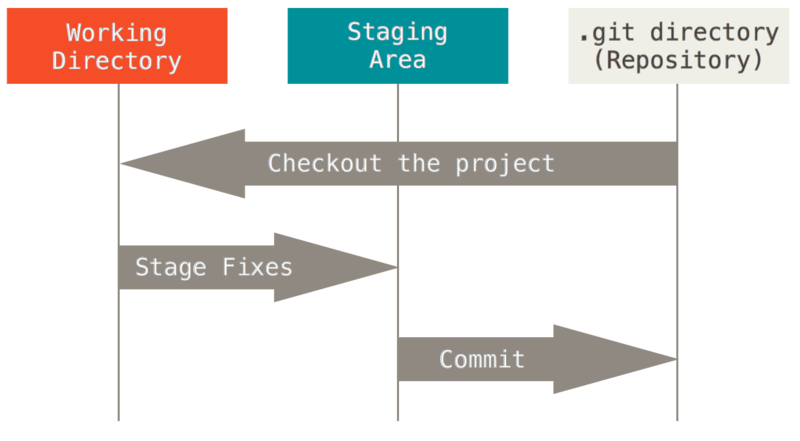 This guide will provide you with a minimal set of Git commands that useful in any project no matter how tiny. To keep this guide general we will only utilize the Git command line. Many GUI front ends are available for Git but they usually implement a subset of what is available from the command line. Good tips on undoing stuff. Git allows you to take and keep permanent "snapshots" of you project at any point in time via an action called a commit or checkin. This is represented in the figure below from Git-Basics. A snapshots of project history via git. All these snapshots are saved in a very efficient form in the git repository. The git repository is simply a directory .git that Git will maintain within you project directory. Do not accidentally delete this directory! The basic Git workflow goes something like this: 1. You modify files in your working directory. 2. You stage the files, adding snapshots of them to your staging area. 3. You do a commit, which takes the files as they are in the staging area and stores that snapshot permanently to your Git directory. Git file states and workflow. The concepts so far allow for a single "line" of development, however the power of git comes from its ability to branch off a new line of development from any commit point. This is what allows you to go back to a previous "snapshot" in time of your project and start working from that point (you set up a new branch). Branches in Git are inexpensive computationally and storage wise (this is not true of all VCSs), so you can make frequent use of them as the Tutorial section will demonstrate. In the next section we present a summary of a minimal set of commands that we&apos;ll use in the tutorial and that you may want to use with you personal projects. Then the tutorial section will put these concepts into action! A couple final remaks: * Git works best with text files rather than binary files, though it can handle both. I take "snapshot", i.e., commit my work rather frequently, especially after I&apos;ve gotten something to work! Hence multiple times a day would not be unusual. I set up a new branch either because I&apos;ve messed up and need to start work from an old commit point, or I&apos;m about to venture into the unknown, i.e., use a new library or framework, work on a new piece of functionality that I&apos;m uncertain about. You can always add, delete, or rename branches. Note that combining branches requires merging which we won&apos;t cover here. See Basic Branching and Merging. Commands to initialize, add, and commit files/directories. git status Lists the state of files in the working directory. The -s option produces a shorter output. git add files Adds files to the staging area. Common file wild cards are supported. git commit -a Stages and commits all modified tracked files. git commit -m "message..." Use the -m option with a double quoted string to set a commit message on the command line. git mv Used to rename a file in git and in your directory. Commands to recover from recent goofs or visit the past. git checkout fileName Puts the file fileName back to its condition after the last commit. git reset --hard Puts all the tracked project files back to their state at the last commit. git log Used to view the commit (snapshot) history. git checkout commitHash Sets your tracked files to their state at a particular commit. Good for looking but don&apos;t work on these files, set up a new branch for that. git branch List the names of all the available branches. git branch -v Lists all available branches and some info on their last commits. git branch branchName commitHash Creates a new branch called branchName at the commit point indicated by commitHash. git branch branchName Creates a new branch called branchName at the current "commit". git checkout branchName Checks out the branch branchName into the workspace. git checkout -b branchName Creates a new branch called branchName from the current commit and checks it out to the workspace. git branch -m oldBranchName newBranchName Use this to rename your branches. Create a new directory for this project. Name it anything you like, we&apos;ll refer to it as ProjDir here. In the ProjDir create a file called sample.txt. Add some text to the file. I added "My first edit of this file." to the file. Version control this project. From within the project directory run the command git init. This will create a .git directory and set you up to start version control. Type the command git status. This should tell you that you have an untracked file sample.txt. To "stage", i.e., start tracking the sample.txt file use the command git add sample.txt. Run the git status command again to see that the sample.txt file is ready to be "committed". Use the command git commit -m "my first commit" to commit the file to version control. This gives us a snapshot of our project state at the time a commit. The portion after the -m argument is a string you use to describe the commit. The hexadecimal string following the commit, i.e., 91581331aa8b1f..., is the git commit hash and this uniquely identifies this "snapshot" of our project and can be used to go back to the state of all our tracked files at this point in time. Yours will be different from mine! Add a file named second.txt (put some text into it) and add some more text to the sample.txt file. Run git status. You should see second.txt listed as untracked and the sample.txt file listed as modified. Run the git add second.txt to start tracking second. Run git add sample.txt to stage the modified file for commit along with the newly tracked second.txt file. Run git status to see if all the files you want are ready to be committed. Run git commit -m "Added file and edited other file" Run git log to see the snapshots (commits) of the project over time. Going back to the previous commit just to take a look. Using the information from the git log command I can go back to any point in time by using the git checkout COMMIT_HASH command. Go back to your first commit this way. For me I used git checkout 91581. Note that you don&apos;t need to use the full 40 character hash code, just enough characters to uniquely identify the commit. Run the git status command. What does it say about the HEAD? Did your second.txt file disappear? Can we get it back? How? To get back to the last place we were working on a particular branch we can use the the command git checkout master. Where master is the default name given to the branch we&apos;ve been working on. Now we&apos;ll try recovering from a simple mistake. Delete the sample.txt file. Oh, no, we want it back!!! Type git status you&apos;ll see that git knows the file has been deleted. It also tells you how to get it back, i.e., use the command git checkout sample.txt. Did you get the file back? Now we&apos;ll recover from a bigger mistake. Remove both sample.txt and second.txt files. To get both of these back (or remove all changes you&apos;ve performed since the last commit) use the command git reset --hard. As long as your .git directory is intact you can get back to any previous snapshot using the methods we&apos;ve seen. However, if the .git directory gets deleted or corrupted there is nothing git can do to help you. Hence you still need to perform regular file backups. Frequently additional files are produced by the tools we use. Git will warn you about untracked files. Here we will look at how to ignore specific files and directories. Create files alpha.tmp and beta.tmp in your project directory. Run git status and you will see these show up as untracked. Run git status. Do the *.tmp files still show up? Did the .gitignore file show up. If so add it and commit it. Sometimes we&apos;ll have entire directories within our project that we&apos;ll want to ignore. Create a new directory within your project directory called anotherDir (or anything you&apos;d like to call it). Create three files in this directory, I&apos;m calling mine stuff1, stuff2, stuff3. Run git status and you&apos;ll see that the directory is listed as untracked. To ignore this entire directory add the following line to you .gitignore file. Use git status to see that this entire directory is now ignored by git. Use the command git commit -a -m "Updated .gitignore file" to commit the modified .gitignore file. Suppose we wanted to go back to a particular previous point in time ("snapshot") of and start working from that version from now on. Or suppose our project was in good shape but we were about to try some major changes and wanted to make sure we could easily go back to back to where we were before the major changes. Both cases call for creating a new branch. We&apos;ll look at both. Let&apos;s add and commit some more stuff first. Create a file within your project directory called sunflower.txt and add some text to it. Also add another line to the sample.txt file. Note that you can add both files to the staging area with the command git add sample.txt sunflower.txt. Use git commit -m "Added sunflowers!" to commit these changes. Use git status to check that everything is nice and clean. The "*" indicates the branch being currently used. Take a look at the files currently in your directory and the contexts of the sample.txt file. Now issue the command git checkout noSunflowers. What happened to the sunflower.txt file? Did the sample.txt file change? Issue the git status command. What branch does it say you are on? Log at the commit history with the git log command. Does it show the commit associated with the sunflower modifications? Want to go back to sunflower stuff use the command git checkout master. You can name the branches anything you like, but its best to use names that won&apos;t confuse yourself. Note that master is just a default name that git gives the initial branch. You are allowed to change it on your projects. To avoid confusion lets change the name of the branch master which contains our sunflower related modifications to sunflowers. Use the command git branch -m master sunflowers. Use git branch to see that the name change was sucessful. Also for practice change the name of the noSunflowers branch to main, i.e., use git branch -m noSunflowers main. Switch to the main branch with git checkout main. Doing a major code reorganization. Say you finally got you code working, but its ugly and you wouldn&apos;t want to submit it as an assignment or project in class. Commit it first, then create a branch for clean up. Then in case you break the code during clean up you can easily switch back and forth between the branches to work out any problems. Adding new feature, capability, bug fix to your project. These are some of the most common reasons to set up a new branch and you&apos;ll see these mentioned in the Pro-Git Book. Incorporating a new third party component or library into your project. Many times incorporating a new component or library into a project involves modifying a number of files. Some of these maybe associated with your development environment others with you project files. If you find the library or component doesn&apos;t suit your needs its nice to easily go back to your project as it was before you tried using the component/library. In the git version control system branching is fast and very cheap. If you&apos;ve used other version control systems (VCS) this might not have been the case and branching was considered a rare event and may have even required the VCS administrator do some special stuff. In git you should get used to branching for any of the reasons cited above (and others that I may not have mentioned). For personal projects (including longer class assignments) branches allow you to explore different options or solutions without the risk of losing any of your work! Suppose that instead of the sunflower project addition that we previously tried, we&apos;d like to try an addition having to do with cactus. Use the command git branch to see a list of branches we&apos;ve created. Switch to the main (or whatever you called it) branch if you are not already there with the command git checkout main. We can create a new catus branch starting from the HEAD of the main branch with the command git branch cactus. We switch to using that branch with the command git checkout cactus. Note we can combine both these steps with the git checkout -b cactus command, i.e., creates a new branch and immediately switches to the new branch named cactus. Create a file called myCactus.txt and add some text to it. Edit the sample.txt file by adding some more text to it. Use git add myCactus.txt to stage the new file then use git commit -a -m "Fun with a Cactus" to commit the added file and the modified sample.txt file. To see all your branches along with information on the last commit on each branch use the command git branch -v. Note that the git log command will only show you information about the current branches history. Use git status to check that your working directory is clean. Modify the myCactus.txt file by adding some text. Use git status to see that git knows the file has been modified. Try using the command git checkout sunflowers to switch to the sunflowers branch. Were you able to switch branches? Why or Why not? Is this a good thing? Explain. On the cactus branch commit your changes to the myCactus.txt with the git commit -a -m "Some changes to my cactus" command. Now try using the command git checkout sunflowers. Did it work? If not use git status to help you figure out what went wrong. What files are now in your directory? You can easily switch to the main, sunflower, or cactus branches with the git checkout branchName command.